Recently, with some help from a AN's brother who came back from UK, i ordered some books from the BookPeople. 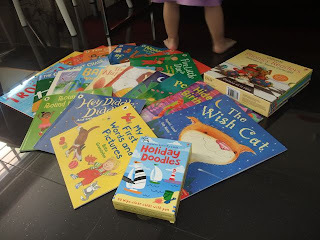 Love the children's books they sell there cos it's quite cheap, especially the book sets. If i go UK one day i'll buy more back. It's really great cos i saved loads on the shipping part (super thanks to AN's bro!!). 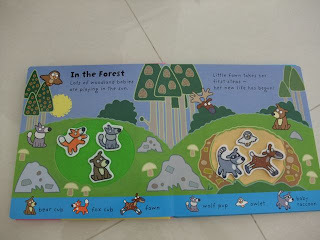 I love the books cos the illustrations were really bright and fun. 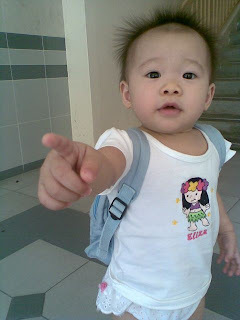 I've cut down the number of books to the budget of S$80, else Ww will give me the 'look'!. Most of them are a little to difficult for Eliza though....and she doesn't seem to be as interested in them as her usual books at home. Maybe it's the soft cover...i think she's so used to those board books and hardcover books. 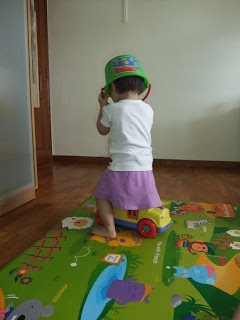 Meanwhile Eliza's having fun clowning around....wearing her helmet and taking the bus. 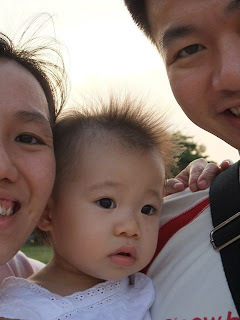 Last sunday we went to Marina Barrage to find Eliza's cousins and maybe go have dinner after that. 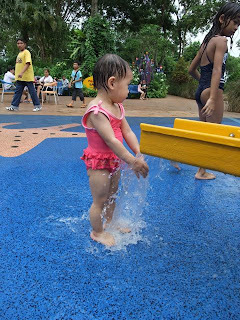 Obviously, the main reason Eliza will bother about is the water play area. 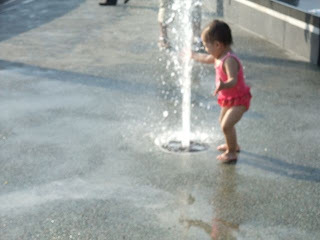 Once the water play area is in sight she was running towards it with her usual water battle cry. 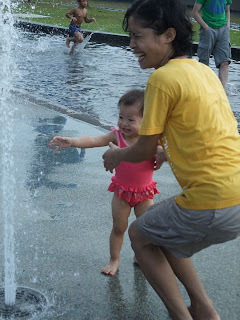 I'm not fantastic at taking photos of her at the water cos usually Ww's the one taking the photos and this time he was stuck at the entrance watching the rock climbing competition that was going on. This is only one of the few photos i managed to take of her...facing me!!! a lot of it was of her back and her running away to somewhere else. she doesn't stay at one place for long anyway. 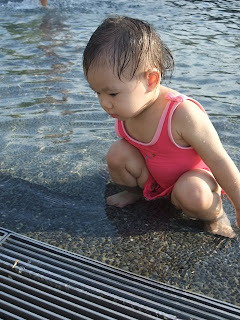 My SIL's helper really likes her and helped me watch/follow her around...especially when Eliza initially kept missing the step in the water and slipped at the metal cover that didn't have any friction sticker. She wasn't too keen on doing what her cousins were doing....and watched them warily. Didn't manage to get this clearly but it was the highlight of the area. I figure as she gets older, the more challenging part of parenting begins. It's the guidance and teaching that one needs to do. And a big part of my challenge is my struggle to stay patient at night and to be consistent. I wonder why she's such an angel in the day but such a little grouch and demanding lil toddler. Last night was bad....which means we had a crying session at 1am till almost 3am. sigh...i was so zombied out today i snoozed late, snoozed while she played in her playroom, and took a good nap when she took her morning nap. This is a tough one cos sometimes i find that what i don't allow her to do, someone else allows her. And then it gets confusing for her. 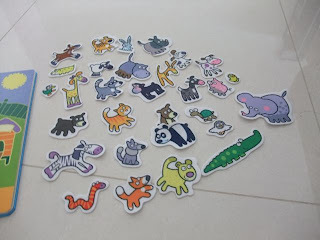 With 10001 things a toddler can't do, it's hard to list that 10001 things. So we try to state out the rules when we meet the situation. Few things are a sure no: no touching the power sockets, no playing with the air-con remote, no wearing of shoes in the house, no pacifer if she's not in her bed...etc. there are stuff that we do like saying grace before meals. somehow she'll almost auto do it when we eat together...but not when i feed her her meals. and there are many times i'll forget it. not too big a deal but these are the little things. God help me here. I await the day she'll wear other shoes. 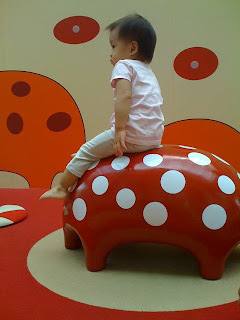 For now it's only her red maryjane crocs which is already too small for her and she'll have blisters if she wears them. 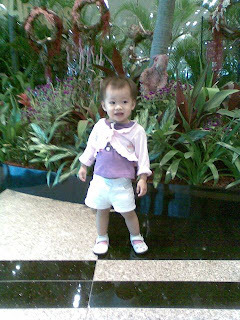 And the only shoe that she wears is her pediped shoe which is still ok but doesn't have much friction at the bottom. The new crocs were too big for her and it still is too big...it doesn't help that she's now not interested in wearing them. bought 2 more shoes and she wouldn't wear it at all. How??? So i'll wait....and maybe try shoe shopping until she finds one she's willing to wear. She's into saying a lot of gibberish these days and it's quite interesting. Just that we cant' understand her. It sounds like she's holding a conversation with us. really cute. which is really nice...especially hearing her say 'please' after she's been signing it so often. 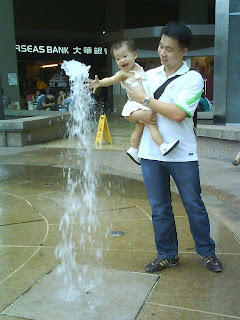 This is really taken quite some time ago....finally transferred the photos from my mil's hp to the comp. Well...at least until she started scratching the dirt stuck at the washing machine and putting in her mouth. This little bag really fits her and she's always so excited to carry it out. My in-laws were quite happy to bring Eliza out gai-gai during the school holidays while i'm at work. Eliza posing for a photo. 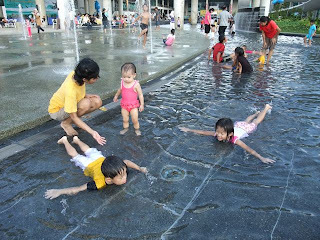 How can we miss Rainforest Adventure water play area. 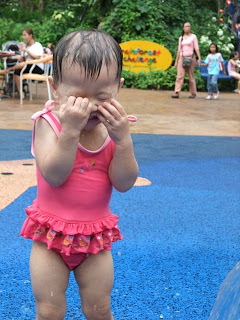 Eliza did her 'battle cry' and tottered very quickly to the pool once we got her changed. Ultimate delight! Obviously we had to try the slides. Eliza wanted to go down fast and she wasn't too happy that i was stopping for a photo. 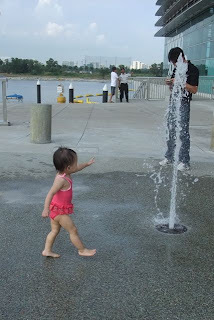 Getting water in eyes is part and parcel of water play...and she always looked like she was going to scratch out her eyeballs or something. We couldn't stay in the water for long cos it was quite windy there and we took her out to change when we saw her shivering. Still there's the playground to play! 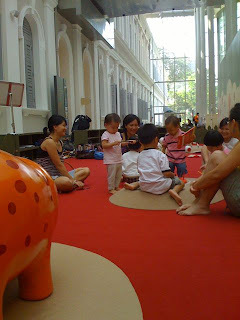 Ww said that there's this kids area where we could bring her and that's actually all we did at the museum. let her play there. 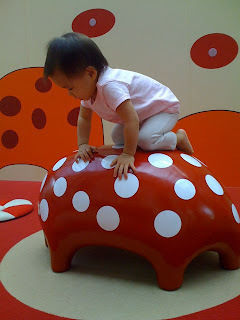 She's getting more steady with her balance nowadays.. Some other kids were having fun poking the colour pencils into the brushy weird installation and Eliza joins in the fun. 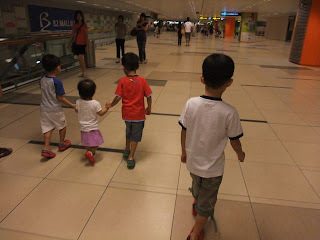 We took a 1.5hr bus ride to Orchard..would have taken half the time but there was quite a bad accident on the highway. It was so boring Eliza fell asleep which was a good thing. 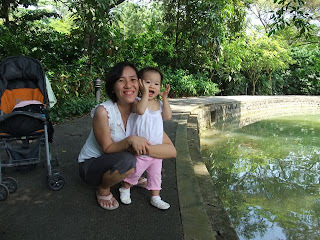 Since we arrived a little to late for a morning walk at botanic gardens we went to Dempsey hill to look for lunch....we walked all the way up. Yes we did. (and we walked all the way down as well) It was quite an exercise that day! 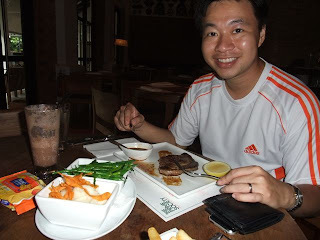 I ate pork ribs....best ribs i've ever tasted!! while Eliza at her bread, some mashed potato, some beans she was quite 'on' about and the fries which she couldn't stop eating, such that we had to eat it quickly and tell her there's no more left. 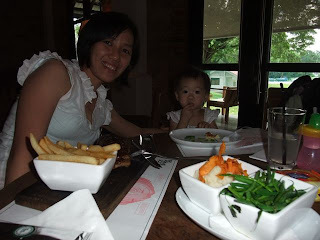 Last week i took a week off to spend some time with Eliza & Ww, to go outings together. 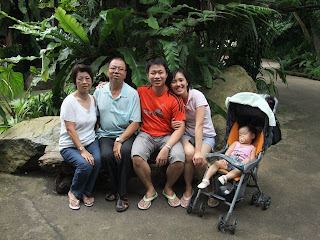 My in-laws went to Genting for 4 days and we happily enjoyed being home alone those 4 days. Not exactly home alone, actually we were out most of the time. Still it's nice to have the house to ourselves. Make a mess...ie leave the clothes unfolded in the living room and go out, leave things around until i bueh-tahan (ok i have a low treshold for toy messes though), pile up the wash till i can max out the washing machine, etc. 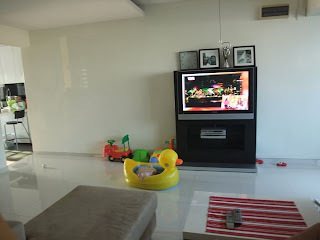 I admit: i don't really like housework, in particular the vacuuming & mopping so Ww does that. I'm ok with the clothes part so i do those. And I cook while Ww washes the dishes and as usual, Eliza's bottles. 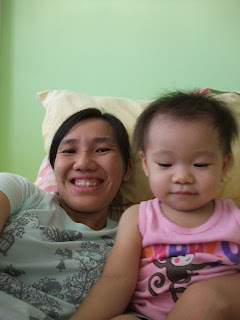 There were some challenging times cos Eliza was teething (we suspect) and having diarrhoea. She wasn't eating much or drinking much milk. But she's a super snacker. So she survived on bread on one of the days. Every where i go it she'll be chanting 'bread bread bread'. Later in the week she was chanting 'cracker cracker cracker'. Hm....did i just say she was having eating issues? 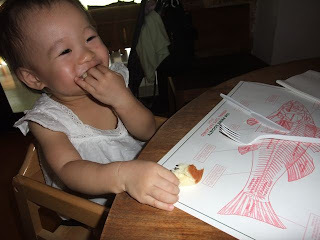 Anyway, she was being super picking on her food and refused to eat her porridge. It got better at the end of the week when her appetite returned and i added our food to her every spoon of porridge and she ate it up really really fast. No need to watch tv....she wants to eat! She was pooing 3-4 times a day, so it was a lot of diaper change and pants change cos sometimes it gets so much it stains her pants/skirt. The zoo trip had a mega poop outburst during her lunch. I wanted to change her after she finished her lunch but she was already propping her leg up and sitting uncomfortably. When i carried her up, the poop was all over the high chair and her pants and leg that i had to carry her horizontally in case my clothes got stained. She was super cooperative, as she usually is. She must have known this isn't the best thing to happen. Ww cleaned the high chair and he said that the cleaning person ran away when he saw what was on the high chair. 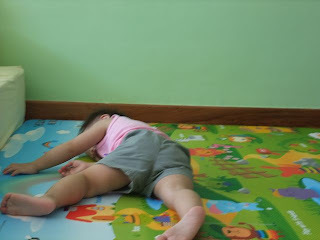 She fell asleep quite well during bedtime, maybe becasue she only had one nap and by 8pm she was ready to go to bed. BUT she'll wake me up at least twice a night to ask for milk and not finish her milk! I realized that asking for milk was her way of making me go out of the room and bring her out as well. It was quite frustrating to wake up to make milk when she isn't hungry at all. One night i thought i bring the milk in so i don't have to go out to the kitchen to make. She wailed even more when i told her the milk was in the room and she wanted to go out. It was a total breakdown for her...sigh. i wonder why she's so emo at night. Anyway, she eventually calmed down after a good walk outside the room and Ww's great idea of watching her fav babysigning time. I love saturday grocery shopping with Eliza and my in-laws. 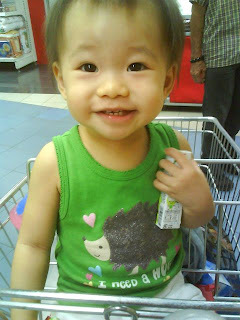 We'll go to Shengsong and NTUC at Bedok and have early lunch if time permits. Else we'll be on our way home and hopefully Eliza will take a nap on the way. 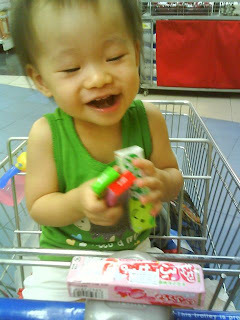 Grocery shopping is a fantastic time to show Eliza the real stuff we've always seen in books and pictures. Shengsong has those huge fish tanks with live fish / prawns / crabs / frogs / clams etc seafood. And we'll always go check out the fishes. 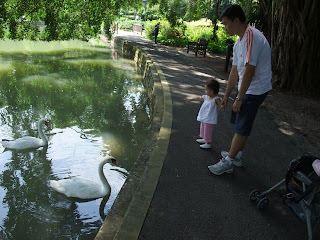 Eliza's not too keen on the black slithery catfishes or those eel looking ones, neither is she excited about the blackish crabs. She'll shake her head and say 'mai mai' and signal me to move away. I discovered a new sign created by Eliza. It's "Cream". geee took me quite a while and her frustration to figure it out! Cos it was bedtime and i forgot to put cream for her and she was sliding her hands like the word 'nice' but it wasn't it. It is the action where she has cream in her hands and she rubs her palms together. I thought it was 'wash hands' but her hands were faced horizontal and not vertical like washing hands. Anyway what relief it was for both of us to get it figured out. The communication gap is becoming more evident as Eliza struggles to get her needs understood and we try to understand her. While she can say some words, she can't exactly say everything and while she understands us, she also can't understand everything. What helps all of us is her pointing, her signing and our questioning. I'll ask her questions that require her to answer yes or no and work by elimination to understand what she wants. 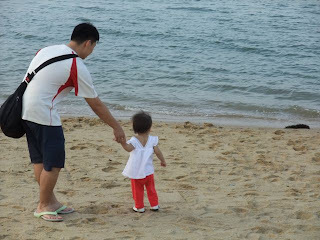 Sometimes it's also easier to carry her and bring her to where she's pointing. But at times she's either too grouchy or too sleepy or too cranky to give us a good clear reply and it all ends up in tears and tantrums. It can be as simple as wanting milk when she wakes up from naptime. Usually we'll carry her out of bed, and let her drink water. 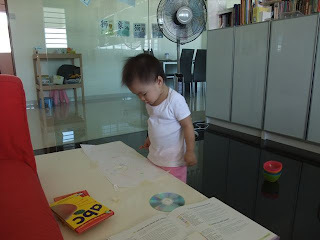 Today it was lunchtime but she must have been famished (that's another story), and wailed for something we couldn't understand and when i sat her on the sofa to drink water, she got upset and whined/cried more intensely. in the end we figured it was milk. 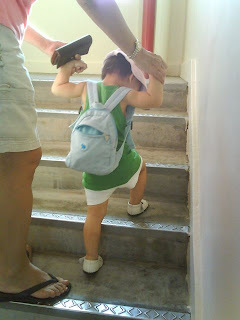 Gosh toddlers this age have quite a temper! Of course she's back to her cherry chatty self after her little dose of milk. Meanwhile she's expanding her little repertoire of words, slowly but surely. will add on when i remember what else she says. 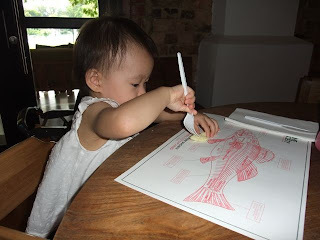 meanwhile we're still discovering new signs that she learnt on baby signing times though much slower cos some stuff she just doesn't want to sign...not useful i guess. Interestingly, once she's able to say the words she used to sign, she'll sign that word lesser, ie banana. or she'll sign and say the word at the same time ie asking for cheese. I've also discovered that Eliza a little social butterfly...at least among kids her age and size. 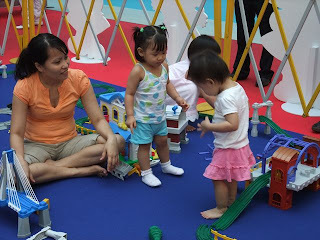 We'll go play and she'll chat up that little kid near her or far from her instead of playing the toys. 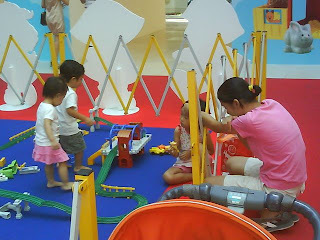 Kid no.1, ambush from behind...dunno what she was telling him, in the end got some car to play. Later she went to talk to some kid with a mum...dunno what she said..and then walked away. And then Eliza pointed to her shirt...probaby telling the little girl that she has flowers on her shirt cos i was showing her the flowers on her shirt that morning. Funny what goes on in their cute little minds. We have been going to MyGym lessons for 3 weeks already and I realized i haven't posted much because we can't take photos in there by then there's so much other activites on the weekends that i talk about all the other stuff. ANYWAY....Eliza, according to my mil, has a pokey-bum aka she can't sit still. It's not any better during class time, even the teachers noticed it. She'll always have something to do, and never ever clingy to me. 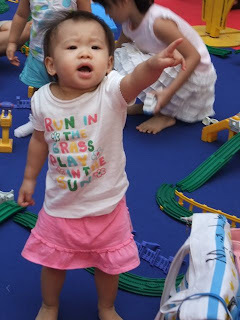 Of course it is great that she gets to run about, climb and play but she's not interested in circle time and the activites either. One of the teacher suggested that we make use of the freeplay to let her run it out in the week so that when she comes for lessons she won't be too hyped out. Problem was, i don't have time to bring her for freeplay in the weekdays (cos it's only wed & thus) and we usually have other stuff on weekends. This week however, i brought her to the freeplay time that's about an hr before her actual class. Obviously she had quite good 1/2hr or climbing, jumping into the ball box, sliding, chasing the balls and making me follow her all around. 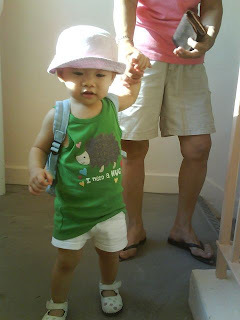 When we came back for lessons, she happily sat through the welcome time and enjoyed it as well! Yays! :) Another good thing is that she did the practice activity and all the gym stations. 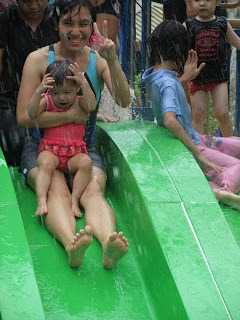 Loved the one where she got to jump and be turned upside-down, she was super enjoying it. She also started saying "ta-da" when prompted. sounds quite cute. Every weekend is fun. 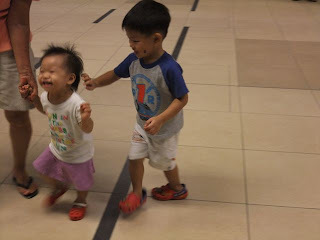 This weekend we had Eliza's cousins come over and boy she was super duper elated. Toddlers really wear their emotions on their sleeve and they hide nothing. Whatever they feel, they express it all out. And it's really quite interesting to see Eliza getting so excited over things like the duck float, her cousins coming to our place, the playground, water fountains etc. 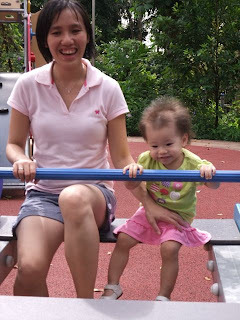 We do a lot of outings these days, even if it's just to take a walk at the park, to the playground or to the airport. It's kinda good that the airport is so near such that we can just take a 15min bus ride down, great place for her to run. 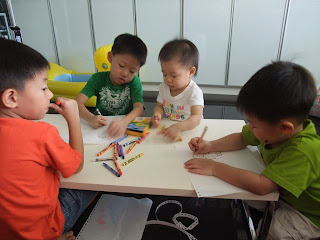 On Friday mornings i've some play routine i'm tryin to set up where we read, have some structured play and drawing. Most activites don't last too long anyway but still it's something to do together. At times i can do some reading while she busy herself. Here's Eliza looking at her artwork. I got washable crayons for her to scribble but most of the time she wants me to draw stars. 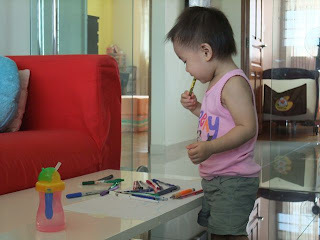 And there she goes...biting the crayons *slap head*. There's a good reason why kids crayons have to be non-toxic. She is bending forward in the duck. Kids know the best ways to play. 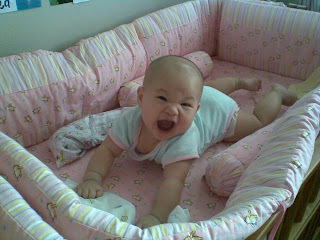 Some mornings or afternoons we'll be in her playroom having free play. I usually don't let her empty ALL the toys in the 3 boxes and will only allow one box to be emptied. If she wants the other box of toys she'll have to keep the current one. So sometimes the mess gets quite minimal in the room with one or two sets of toys to play. 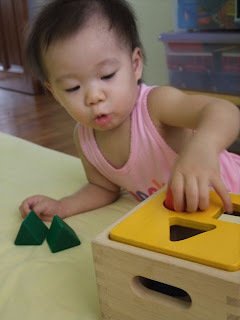 She has been getting better with this shape sorter (love these wooden toys), though i do feel that she's not 100% getting the gitz of it and it's mostly trial and error. At least she's not throwing the yellow cover away to put in the pieces. The playmat extends the playarea and so she loves rolling around it, doing her tang2 tang2 and (not seen here) moving the pillows and bolsters from the bed to the playmat. Me trying to take a photo of Eliza with me. 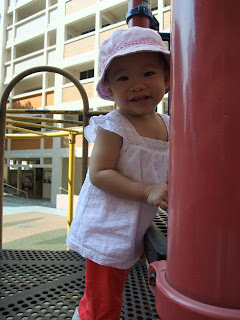 We stopped by at the playground at our house..and Eliza's getting more acquainted with the playground...climbing up the stairs and down the slides. 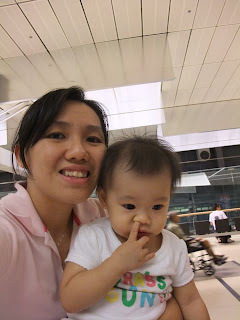 We wanted to go tampines central but she was sleepy on our short bus ride there so we thought we take another bus ride to airport (cos it's not that near and not that far) so that she can take a nap. And she did. So what do you do with a 10kg sleeping toddler when you're outside and have no stroller for her to sleep in? 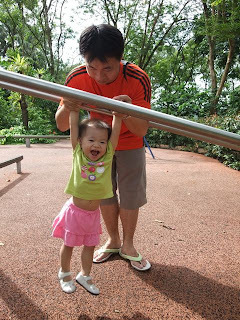 And went to Pasir Ris park. Trying to take photo of 3 of us together is quite a feat. this was the best photo of the few i tried to take. Drawing and scribbling seems to be quite a fun activity. 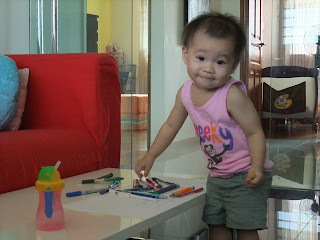 Eliza joins in to help keep the crayons or rearrange them or pass them to her cousins. Basically she was all around them while they draw away. After dinner at my mum's place we came back to find my in-laws and the boys heading out to the airport. It was 8pm and i wasn't sure if i wanted her to go since it's so close to bedtime. Still, we went anyway. This is the super duper elated Eliza at the airport. 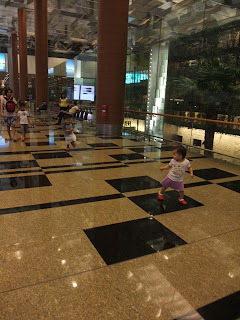 I can't remember if it's cos she saw the playground or the cars at the foodcourt side. But this is the look! We went to the viewing mall to look at planes but i forgot that at night, the lights create reflections on the glass such that you can't see outside.